As air travel worldwide continues to grow, there is an ever-increasing demand placed on airport infrastructure systems. Concrete pavements, for example, carry both larger volumes of aircraft traffic as well as higher loads than originally intended. This has resulted in the need for many pavements to be repaired or replaced. Repairing and returning these pavements to service quickly with only minimal disruption of their use are an economic imperative. An innovative, patented, high-early strength concrete known as the 4x4 Concrete System has been developed for fast-track replacement of deteriorated pavements to permit early opening to traffic. The 4x4 Concrete System achieves 400 psi (2.8 MPa) flexural strength within 4 hours after placement. 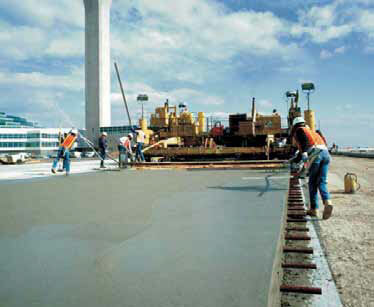 It can be modified to achieve a flexural strength of 550 psi (3.8 MPa), the minimum opening flexural strength established by the FAA for airport pavements, and is an economical alternative to proprietary fast-setting cement concrete. The 4x4 Concrete is produced using locally available portland cement and aggregates and uses a unique combination of BASF’s Glenium high-range water reducers, Delvo hydration-control admixtures or RheoTEC Z-60 workability-retaining admixture and Pozzolith NC 534 accelerating admixture or Rheocrete CNI corrosion-inhibiting admixture. 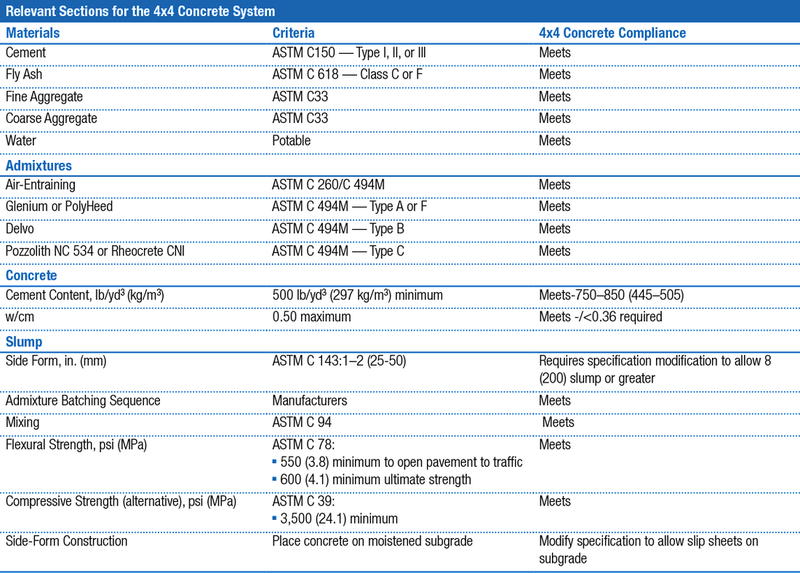 Airentraining admixtures such as BASF’s Micro Air or MB-AE 90 admixtures can be used where the concrete has to be air-entrained. The 4x4 Concrete System is ideally suited for use in the fast repair and replacement of deteriorated airport pavements — runways, taxiways, aprons, etc. ​Portland cement based systems usually require a minimum of 24 hours to develop sufficient strength and up to 14 days to return to service. 4X4 is ready for loads in 4 hours and back in service within one day.